This would be a different kind of war – a war in which special operations forces would be key. Intense air and missile strikes began offensive military operations on Oct. 7, 2001, while U.S. Special Forces initiated a covert campaign of assistance to various Afghan opposition groups and provided target designations for coalition air strikes. Although not a member of the joint Special Operations Command (SOCOM) at the time, the Marine Corps marked its historic role as the nation’s first combat responder that same day, with Marines and sailors from the 15th Marine Expeditionary Unit (Special Operations Capable) or MEU(SOC) arriving in northern Pakistan to establish a forward operating air base and logistical hub. The 15th was one of seven Marine amphibious units given additional special operations training and redesignated as MEU(SOC)s about the same time SOCOM was created in the 1980s. Their arrival hundreds of miles from their Navy base ships in the North Arabian Sea took the Taliban by surprise; they had not expected to face the traditional “assault from the sea” Marines in the land-locked nation of deserts and mountains they had ruled for more than a decade. MEU(SOC) operations also reflected the first U.S. Marine Corps move into special operations forces (SOF) combat missions following a Nov. 9, 2001, memorandum of agreement between former Marine Corps Commandant Gen. James L. Jones and SOCOM Commander Gen. Charles R. Holland (USAF) to examine enhanced interoperability of the two forces in the wake of 9/11. A few weeks later, on Nov. 25, 2001, the 15th took Marine Corps amphibious doctrine to a new level with an amphibious assault more than 400 miles inland. Landing at a remote air base 90 miles southwest of Kandahar, Afghanistan’s second-largest city, they accomplished two firsts for the American military in this new war: The first forward operating base (FOB) – Camp Rhino – and the first significant conventional ground presence in country. They quickly followed up with the seizure of Kandahar International Airport – their second FOB – and, working with coalition forces, captured a large number of Taliban and al Qaeda fighters. In December, the 15th was joined by the 26th MEU(SOC); together, they built a prison camp to house more than 400 enemy fighters. The two units also were brought under the command of Marine Task Force (TF) 58, headed by then-Brig. Gen. James N. Mattis, who had been commanding general of the 1st Marine Expeditionary Brigade. By placing Mattis in charge of some 8,000 Marines and sailors in the two MEUs and the Navy’s USS Peleliu and USS Bataan Amphibious Readiness Groups (ARGs), then-5th Fleet Commander Vice Adm. Charles W. Moore Jr., also commander of all U.S. Central Command (CENTCOM) naval forces, made Mattis the first Marine to command two Navy ARGs. Also providing SOF-like capabilities to Marine operations in the early days of Operation Enduring Freedom-Afghanistan (OEF-A) and, a few months later, Operation Iraqi Freedom, were the Force Reconnaissance (FORECON) companies, which provided deep reconnaissance intelligence as well as direct action capabilities to all components of the Marine Air Ground Task Force (MAGTF). On Sept. 11, 2001, Col. Scott D. Campbell, later to become the commanding officer of the 15th MEU, was a Force Recon Marine serving as the executive officer of a 26th MEU(SOC) battalion landing team. That relationship saw its first major test in March 2002, as Force Recon Marines joined Navy SEALs, Army Rangers, Air Force Combat Controllers and Pararescuemen, and CIA paramilitary officers in what has been called the bloodiest engagement of the Afghan conflict – the Battle of Takur Ghar. Part of the larger Operation Anaconda, a nine-nation coalition effort to drive the Taliban and al Qaeda from their stronghold in the Shah-i-Kot Valley of eastern Afghanistan, Takur Ghar pitted the U.S. multi-service force against entrenched al Qaeda fighters atop a 10,000-foot mountain. U.S. forces wanted Takur Ghar as a key observation post from which to direct Anaconda in a valley where Afghan forces had twice defeated the Soviet Army during the USSR’s occupation of Afghanistan in the 1980s. But al Qaeda already had established its own well-concealed, heavily fortified force atop Takur Ghar. 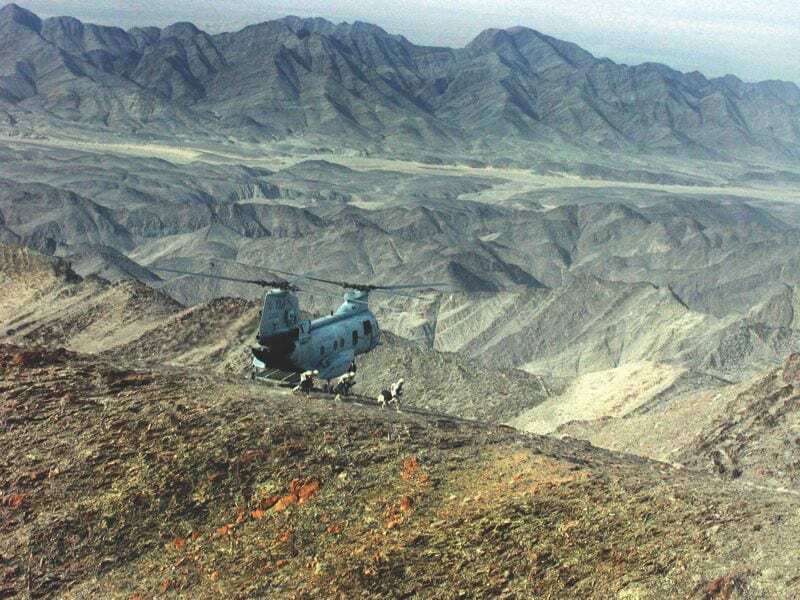 Although only two days at the start of nearly three weeks of Operation Anaconda, Takur Ghar was the scene of intense small-unit engagements, including heavy small arms and mortar ground fire and attacks by helicopters and other air support. It took the lives of eight U.S. warfighters, with many more wounded – roughly half of all Anaconda coalition casualties – while killing an estimated 200 enemy fighters. After-action reports described Takur Ghar as key to the ultimate success of Operation Anaconda. According to unclassified documents from TF 58’s operations in Afghanistan, it was apparent from the start that air strikes and special operations alone would not drive the Taliban from power nor put al Qaeda on the run. But the nature of the enemy and the environment – physical, political, and cultural – demanded something more than traditional “boots on the ground.” It was why TF 58 was created – and Mattis wasted no time employing his MEU(SOC)s and Force Recon Marines. Anticipating a long campaign, Mattis (who is now CENTCOM’s commanding general) set out to establish a battle rhythm he termed more “marathon” than “sprint.” One of his first decisions was not to merge the two MEUs, but to establish a supporting relationship between them – as one MEU executed a mission, the second would prepare for the follow-on mission. Commanding the 15th MEU(SOC) was Col. Thomas D. Waldhauser (now a lieutenant general commanding I Marine Expeditionary Force), while the 26th was under Col. Andrew P. Frick (now retired). When he launched a series of small, fast raids against targets in southern Afghanistan in November 2001, Mattis made it clear his goal was to “create chaos, denying the enemy their sense of security.” It was a theme that would continue, with considerable success, throughout the operation. The combination of traditional structure, tactics, and operations with an increased knowledge of and ability to operate with special operations forces set a new standard for Marine conventional forces. “The straight Corps has been doing direct action raids every day of this war, from bomb-making factory take-downs to hunting down Saddam Hussein. We filled that overt gap between the ‘straight leg’ forces operating in the open environment and the special operators doing high-end, high-value target missions,” according to Campbell’s predecessor, Col. Roy Osborn, who was assigned to Marine Aviation headquarters in February 2011. “The pre-9/11 metrics have fallen by the wayside and, to some extent, that has afforded the SOF community the ability [to] focus on those truly high-end, high-risk missions. The MEU(SOC)s and FORECON bridged a gap between traditional conventional forces and the still-evolving special operations components of SOCOM in the early years of OEF and Operation Iraqi Freedom. At the same time, they helped create the template upon which the Marine Forces Special Operations Command (MARSOC) would be built – and paved the way for significant changes in how today’s conventional forces think, train, and fight. In December 2002, Jones ordered the activation of Marine Corps Special Operations Command Detachment (Det) to conduct a two-year “proof-of-concept” operation with SOCOM. Det One completed training and deployed to Iraq in April 2004, establishing a base of operations near Baghdad International Airport. Part of the Detachment, operating as Task Force Unit Raider under Naval Special Warfare Task Group-Arabian Peninsula, quickly became involved in direct action raids and other operations in theater. A second study, by the Center for Naval Analyses, reached a similar conclusion about the value of Corps contributions in the SOF realm, but added “the Marine Corps cannot expect to operate completely on its own terms when supporting SOCOM forces.” In short, to be part of SOCOM, the Corps needed to actually become part of SOCOM, on the same level as the Army, Navy, and Air Force, with a dedicated MARSOC. As the debate continued, the Marines assigned to Det One continued training – but with no indication of a future deployment. In February 2006, word came down that Det One was to be deactivated no later than April 1 and its members returned to the 42 Marine commands from which they had been drawn two years earlier. Lt. Gen. Jan C. Huly, who retired in November 2006 after serving as deputy commandant for Plans, Policies, and Operations during the decommissioning of Det One and the stand-up of MARSOC, believed the detachment was a success as the first Marine Corps component to serve with SOCOM. The creation of MARSOC and its assignment to SOCOM in 2006 led to a number of changes for the Marine Corps, from the removal of the SOC designation for the MEUs to the virtual disappearance of FORECON as MARSOC took over its direct action duties. That became a concern when MARSOC Marines, originally intended to serve aboard ships with the MEUs, were removed from the fleet. The crew of the Magellan Star had barricaded themselves in a safe room the pirates could not breach. That removed it from being an in-extremis hostage rescue (IHR), which would have been handled by a formal special operations unit, such as the Navy SEALs. Osborn said today’s MEUs are, in many ways, even more “special operations capable” than when they were certified as MEU(SOC)s. Now, what had been the primary “SOC” piece of the pre-MARSOC MEU is called the Maritime Special Purpose Force (MSPF), centered around a Force Recon platoon and trained up to a special ops capable level, but without IHR. “So the difference between MEU(SOC) and MEU, realistically, is not great. The certification process today is almost exactly the same as it was in the 1990s, with similar – but more advanced – mission sets, having taken some equipment from the MEU(SOC)s and SOCOM, including the ability to communicate with SOF forces,” Osborn said. “The MEUs worked then and now in the clandestine and overt environment, not in the SOC covert world. So the breakpoint is clandestine overt versus covert. In the opening days of the war in Afghanistan, Marines with limited special operations training provided the nation with both traditional Marine Corps action and proof the Corps was more than able to function in the unique world of special ops. The experiences, lessons learned, and legacy of the MEU(SOC)s, FORECON, and Det One provided a solid foundation for the creation and successes of MARSOC a few years later. Today, MARSOC holds an equal role in SOCOM with the older Army, Navy, and Air Force special operations commands. At the same time, the legacy of the MEU(SOC)s lives on in MEUs that are far more SOF-like than the pre-9/11 Marine Corps. “Mission-functionality wise, today’s MEU can do everything the old MEU(SOC)s could do – and more. The training level we take the MEUs to now is designed to operate in support of, adjacent to, and with SOF,” Campbell concluded. “On our last deployment, the 15th MEU had Marines embedded in various SOCOM task forces for almost the entire seven-month deployment.